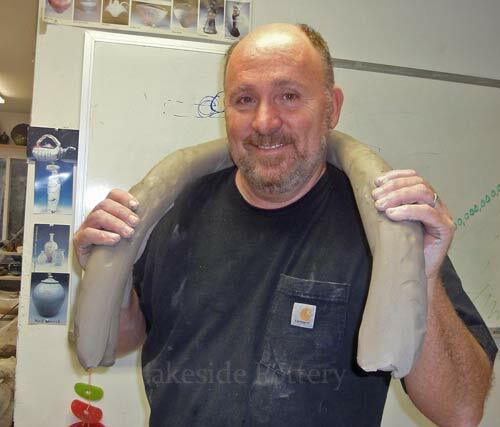 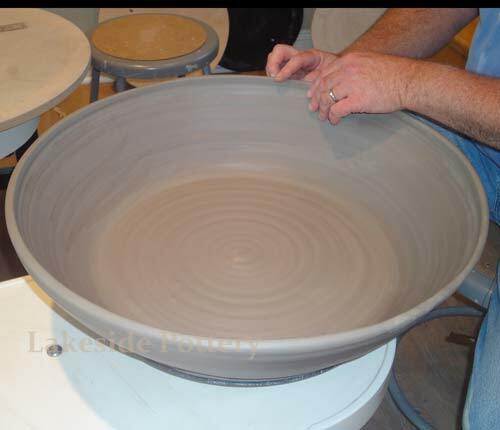 Throwing a large bowl using 50 + lbs of clay can be challenging. 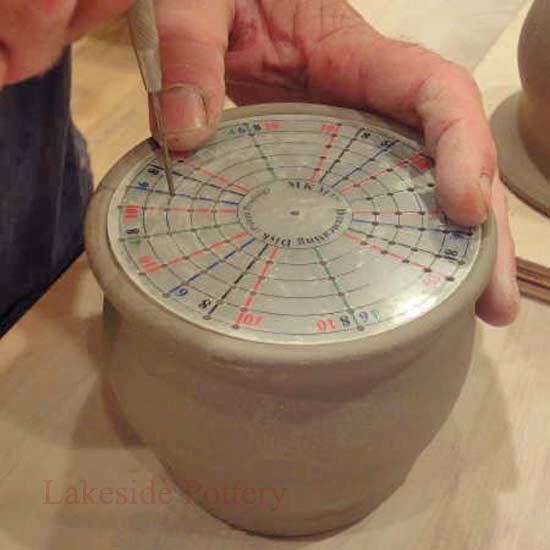 Centering and pulling the walls require a lot of strength and experience. 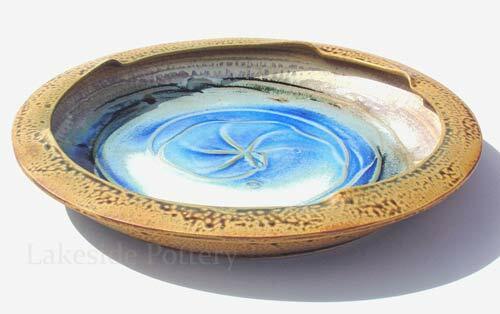 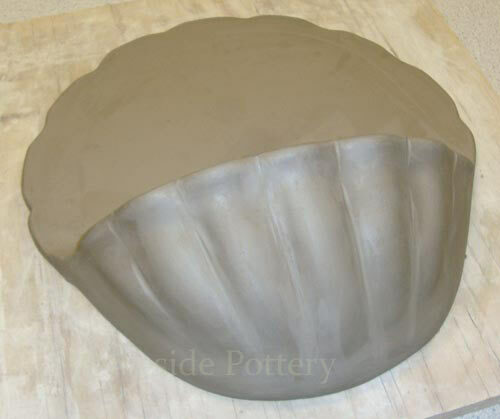 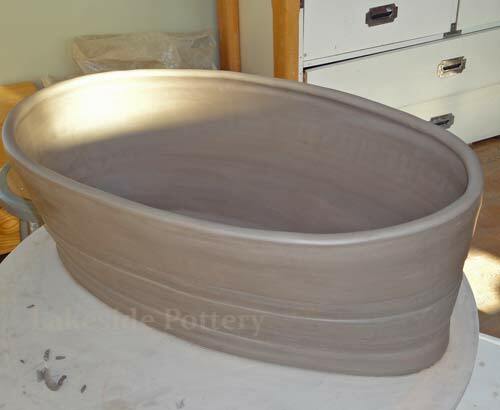 To simplify the process and taking on the task with more confidence, we have documented this commissioned altered bowl 28" wide and 12" tall for you to witness and perhaps try. 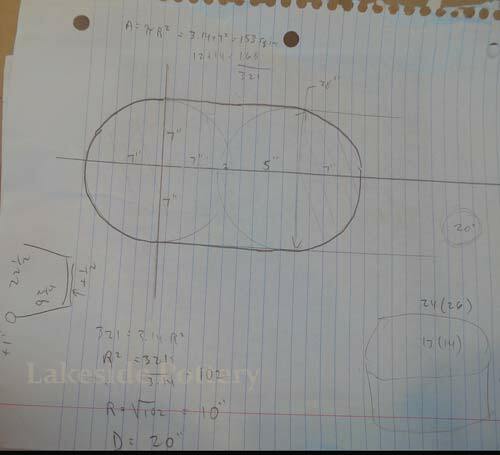 1) To determine what radius pot will create the desired alter, shape some calculations are require as shown on the sketch below. 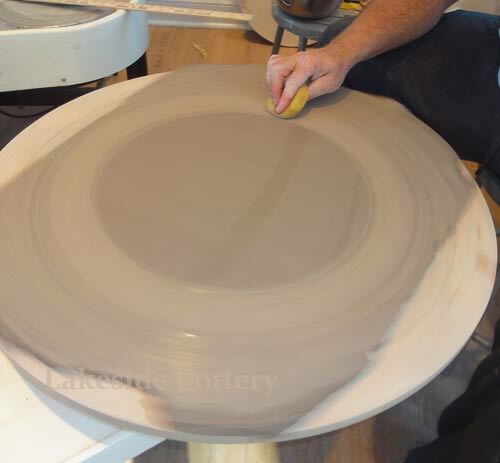 A 20" plastic bat is used with a 3/4 horse power (or larger) pottery wheel. 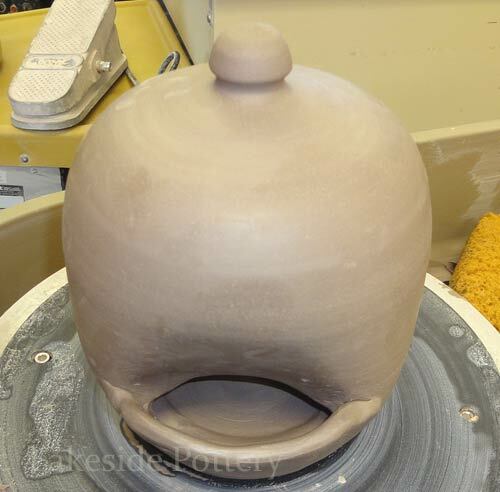 This demo use three sets of 13 lbs coils. 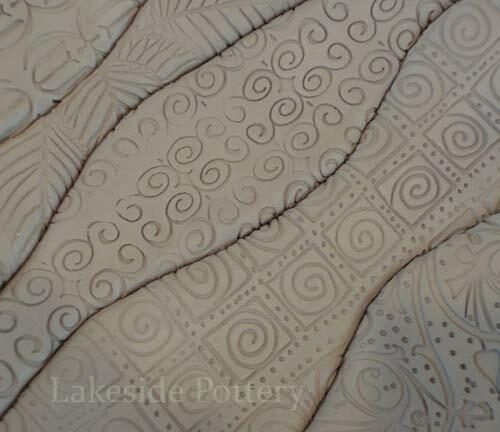 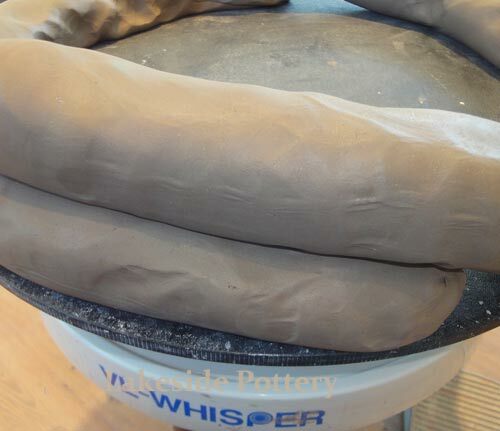 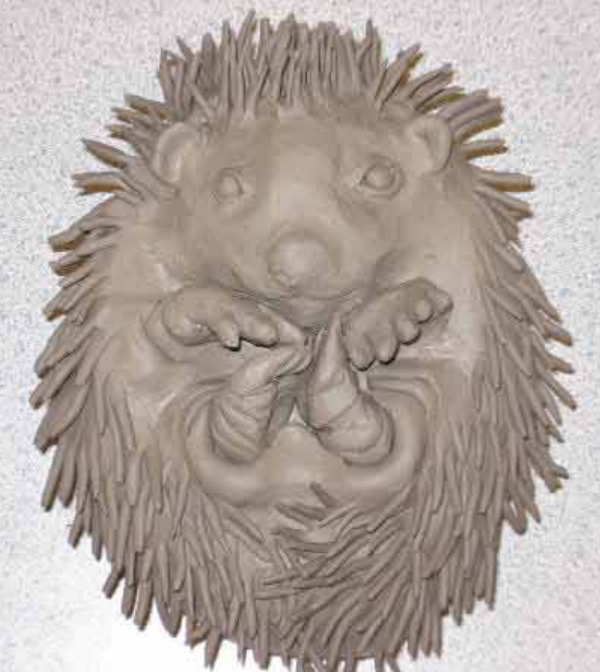 Roll the coils on a non-absorbent surface to insure clay stays soft. 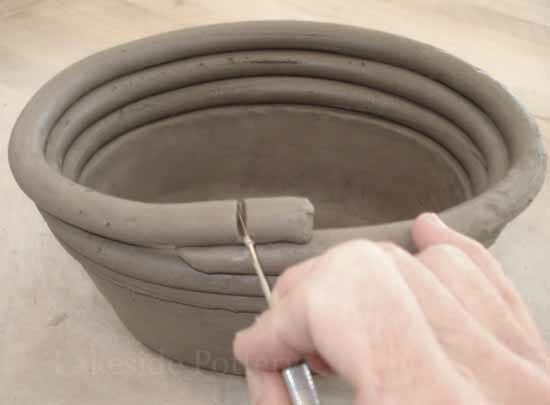 Make the coil as even as possible using both hands. 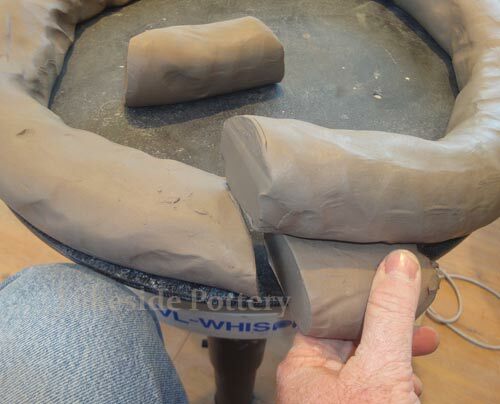 2) Matching the coils pint of contact is really important. 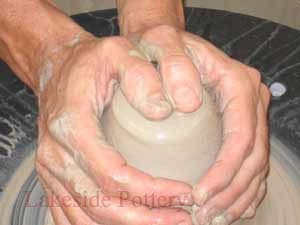 The technique below will insure a perfect match and a solid connection. 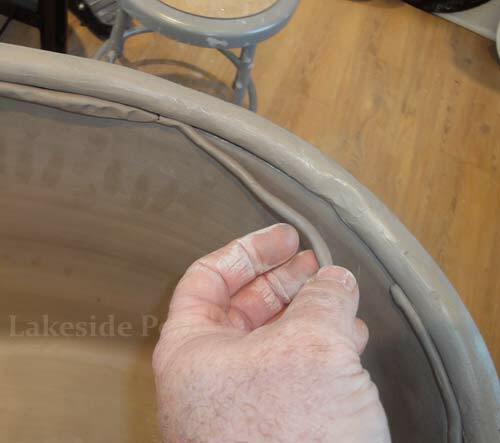 3) Because the coil is rolled by hand and it not perfect, some unevenness will travel to the top. 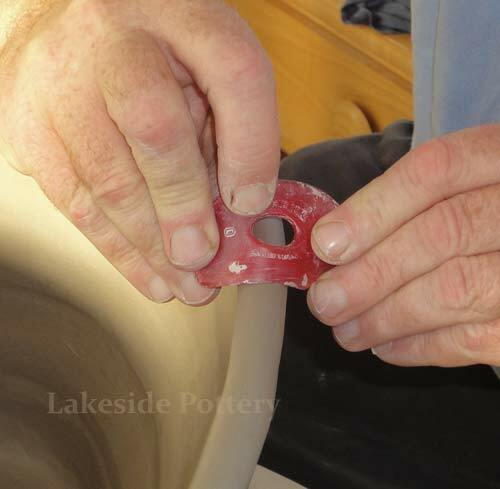 Remove it by cutting the very end of the rim off with a pintool while the wheel is turning slowly. 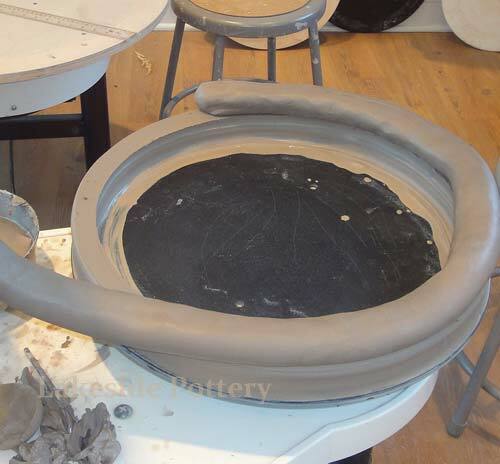 This cut will also provide a solid platform for the next coil. 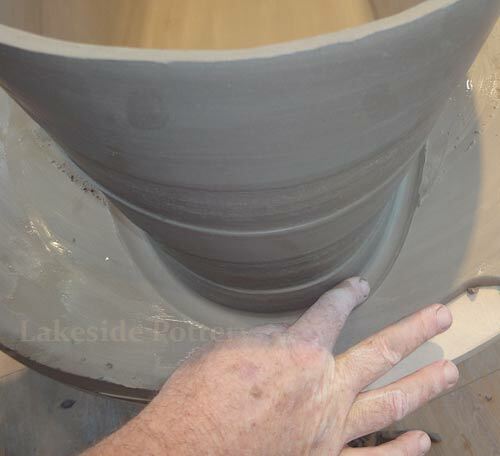 Make sure you do not raise the wall too tall and leave a thick rim to accept the next coil. 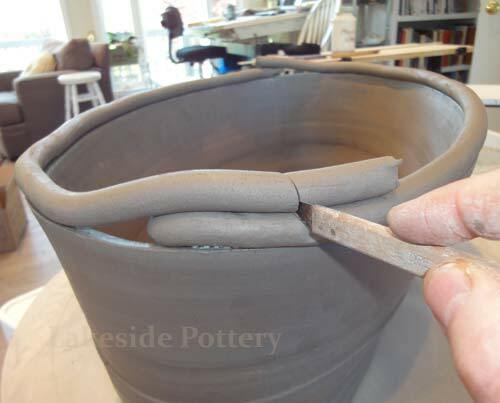 If too thin, the pot will collapse with the extra height. 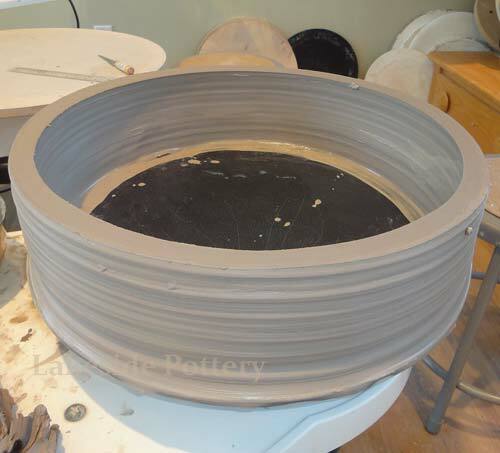 4) The rim of the second layer is now thinner and might not take the weight of compressing in the third coil. 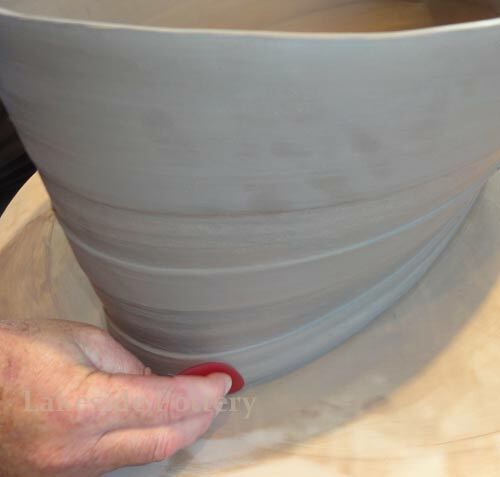 After rolling the coil, place some pressure on top to flatten the bottom as shown below. 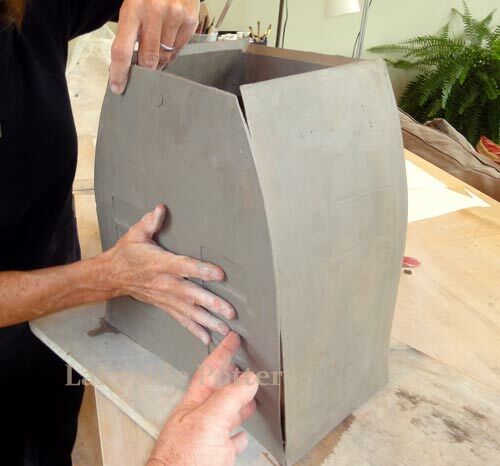 5) Once wall is even but still pretty thick, raise the walls starting from the bottom. 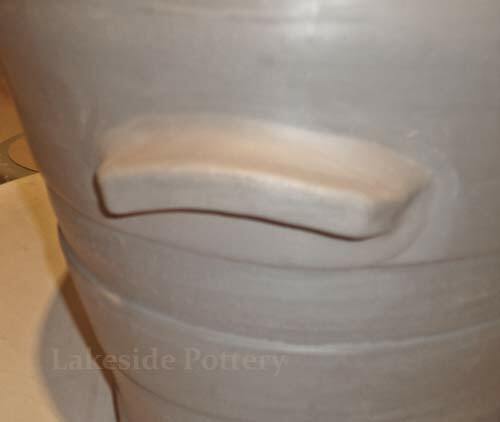 Compress the walls every so often with two ribs. 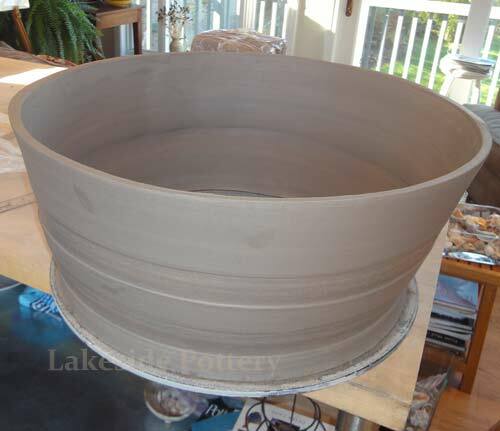 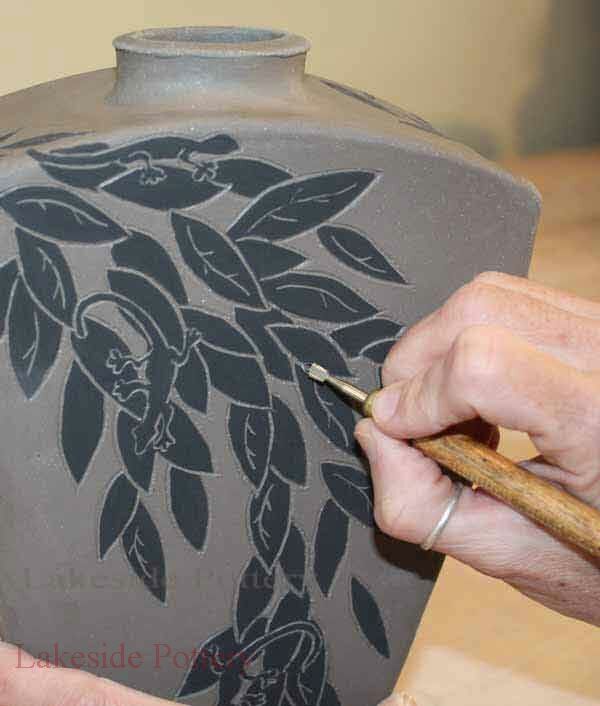 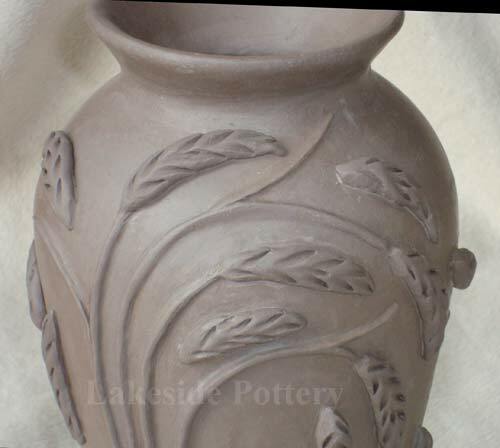 6) In this commission project, they asked for groves on the outside of the pot. 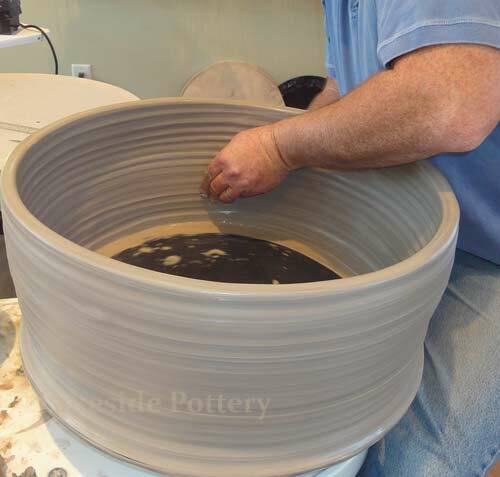 This process is skipped in this tutorial. 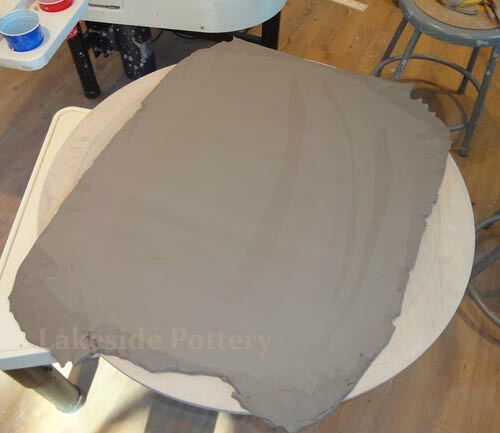 When the pot is leather hard enough to remove and place on a slab, make 1/2" thick slab, smooth and place on a larger wooden bat. 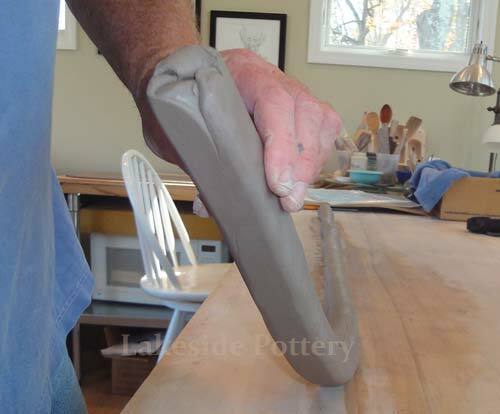 Wooden bat will help with more even drying and will not warp as the pot is carried around. 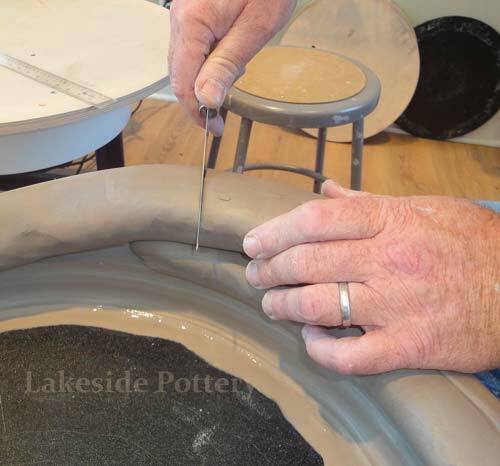 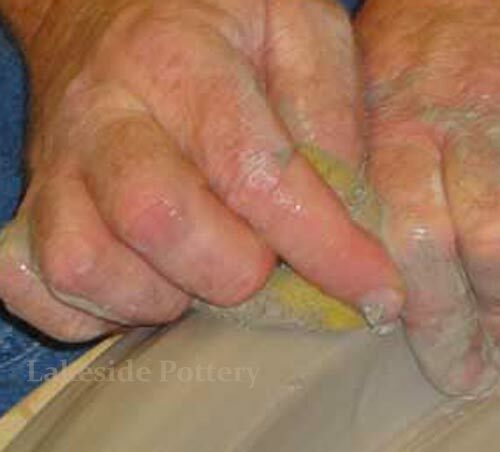 Mark the dimensions of the pot on the slab with the wet sponge so that the pot can be placed accurately on center. 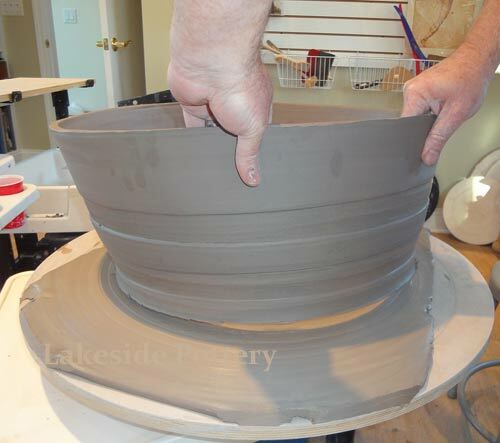 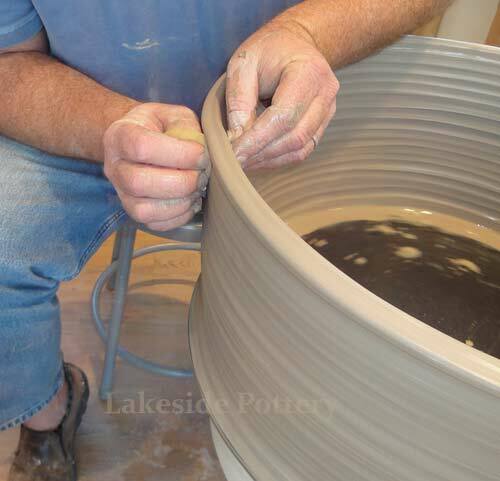 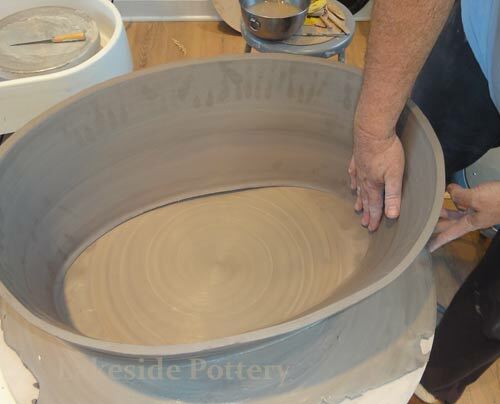 7) Use two people, four hands, to carry the pot onto the center of the already wet slab. 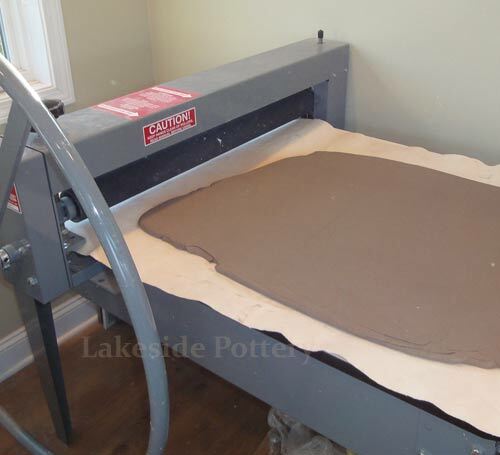 Wet the slab with a lot of water so that altering can be easier sliding the walls to their new location. 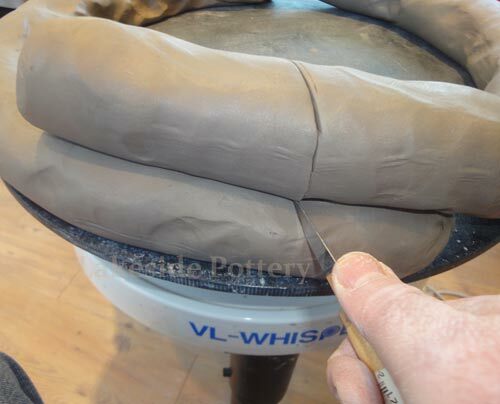 8) Use very soft coil on the inside to blend the seam and smooth with a tool. 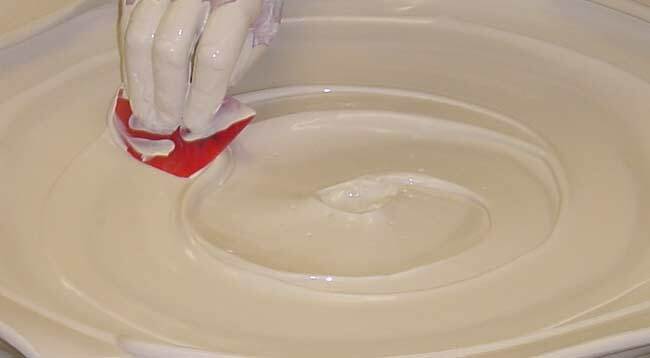 We like to use Sherrill Mud tools red rib. 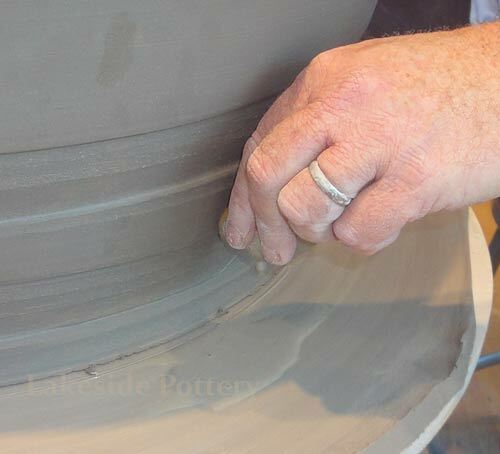 When using the pint tool to cut off excess slab, turn the wheel by hand while your other hand remain in the same location. 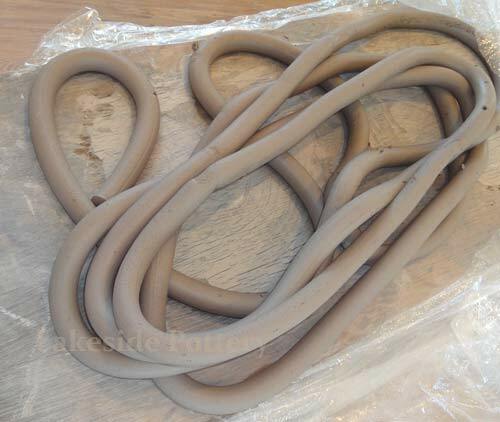 9) The walls might shift as they become more leather hard. 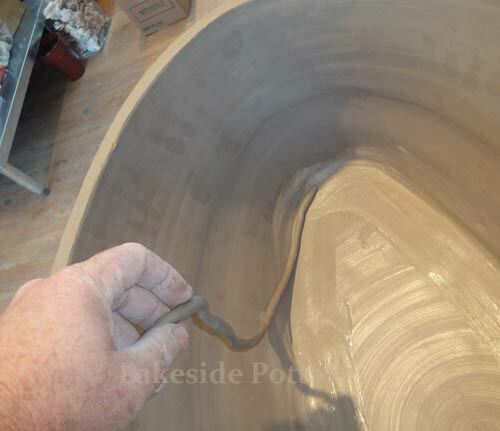 Using some heavy clay post as shown below will help in keeping the walls in place. 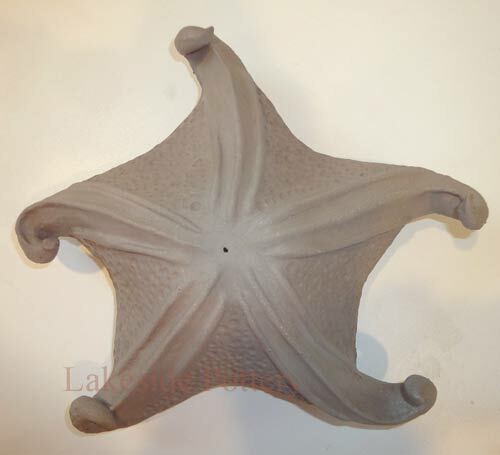 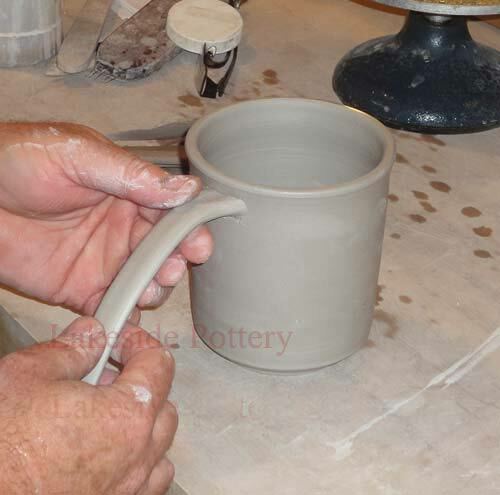 Use an extruder to make the rim. 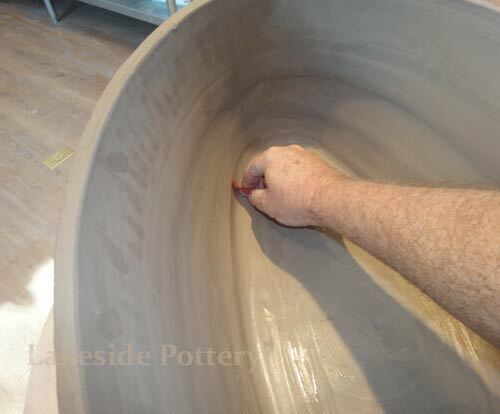 10) Using Magic Water instead of slip is a much preferred way with larger forms. 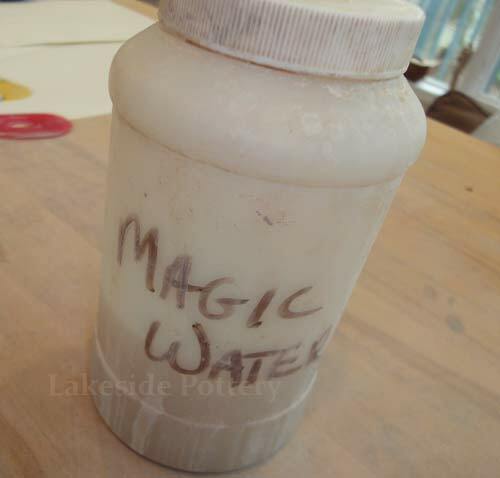 To know more about magic water and it's recipe see Magic Water Link. 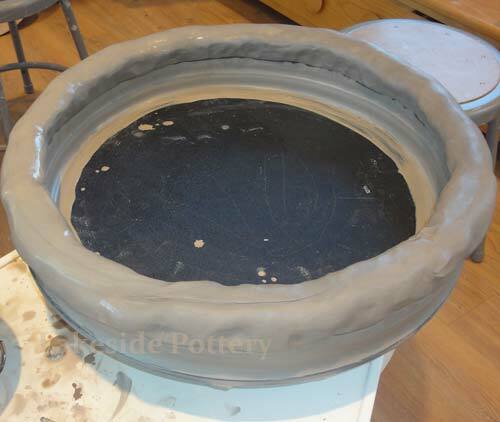 The coil for the rim needs to be soft for better attach em net. 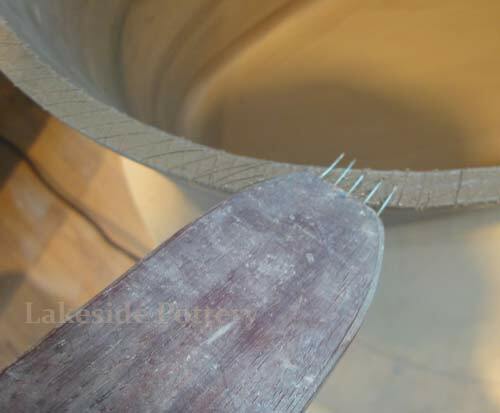 However, to smooth it, it is better to wait a few hours to let is harden a bit. 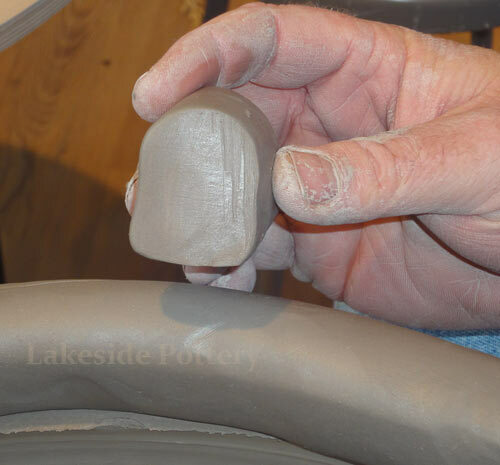 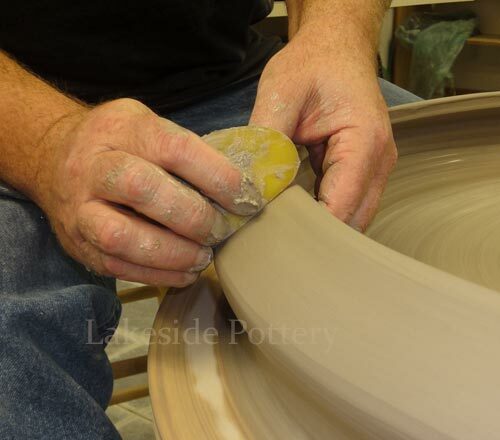 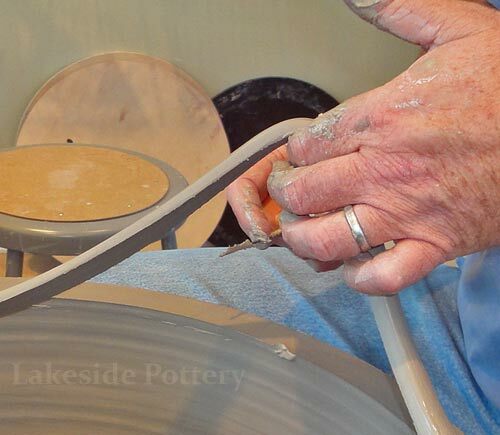 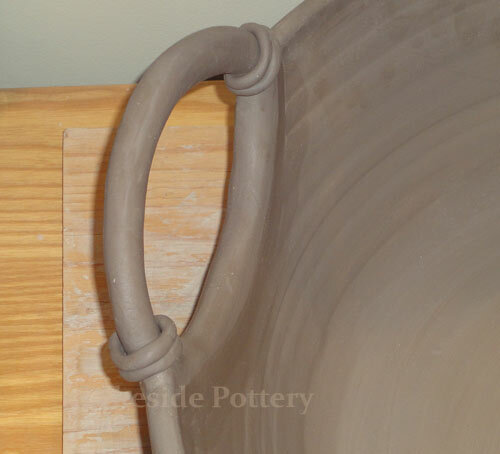 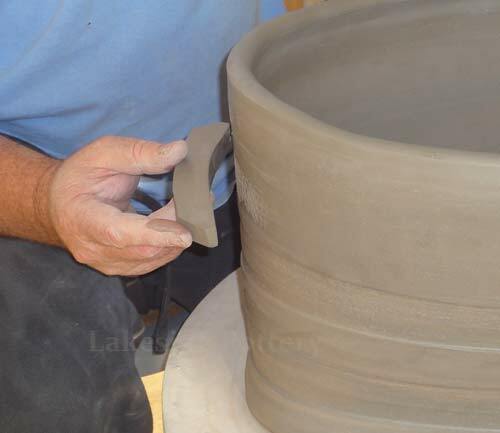 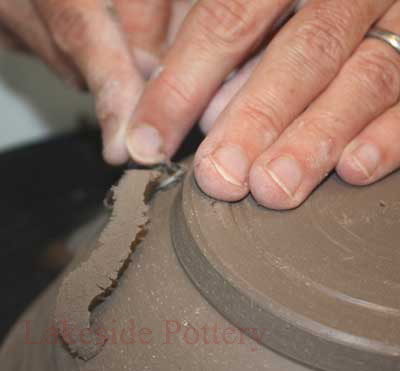 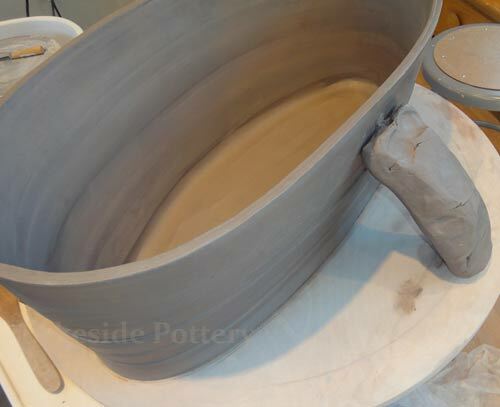 11) Make the handle thick and strong enough to carry the pot's weight. 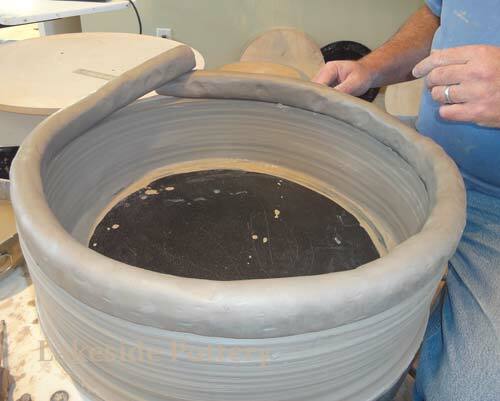 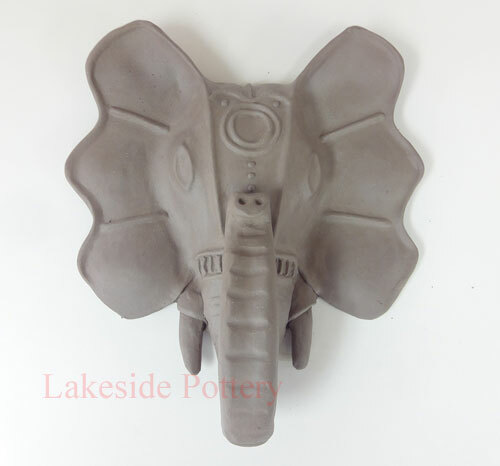 12) Below is another pot (24") that used the same coiling / slab technique but without altering. 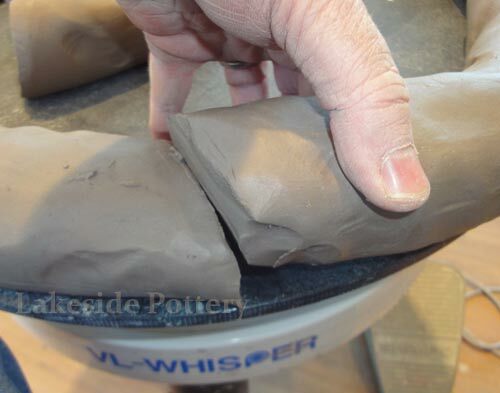 1) Cover tight and let the clay moisture content equalize for 2-3 days. 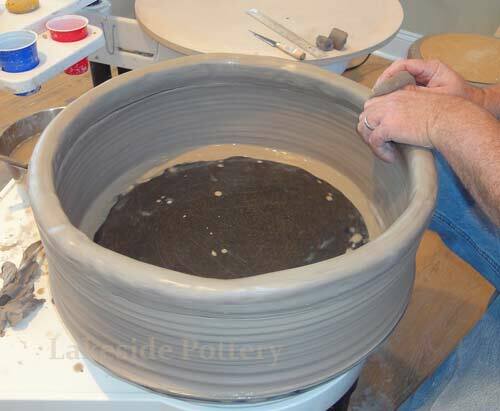 2) Cover the whole pot loosely for 1-2 weeks and make sure the rim does not dry first. 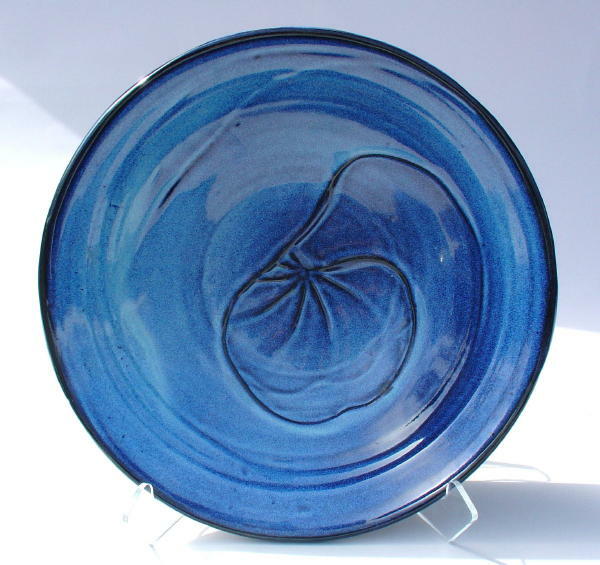 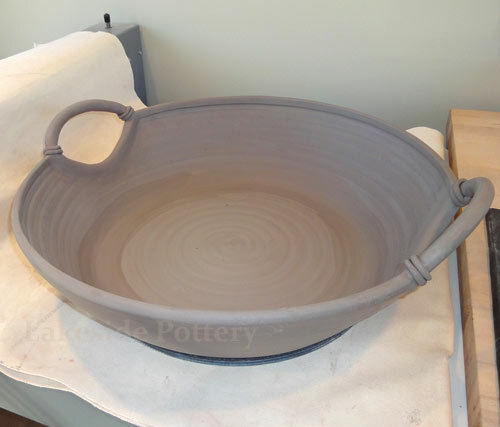 If the rim drys first on such large bowl, cracking at the rim's is very likely. 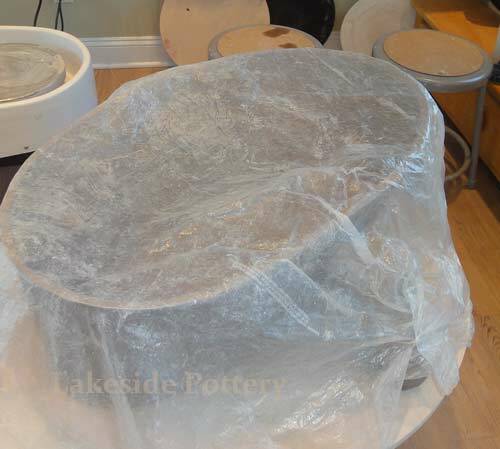 Drying Tip: Flip the plastic cover once a day while drying. 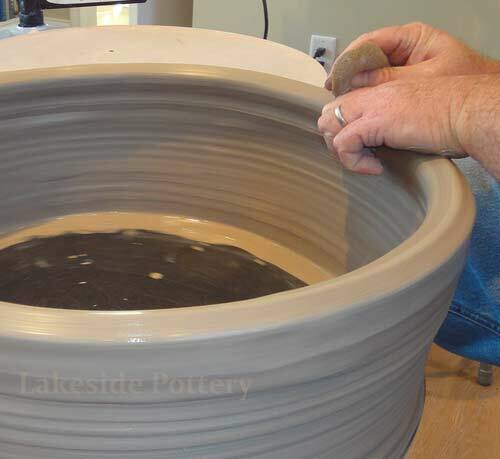 The moisture that accumulates on the plastic surface will be facing up after flipping, thus, removing water a bit faster from the enclosed large pot. 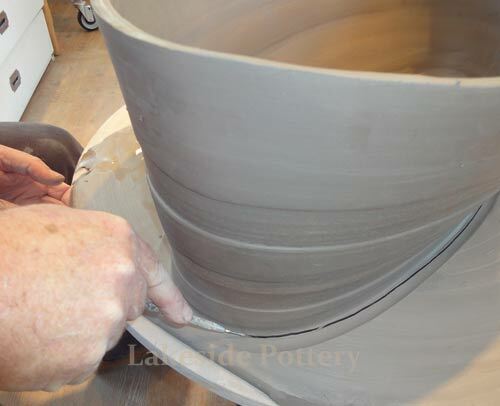 3) Before trimming, make sure the pot is on the harder side of "leather hard" to insure the pot does not warps when it is flipped over for trimming. 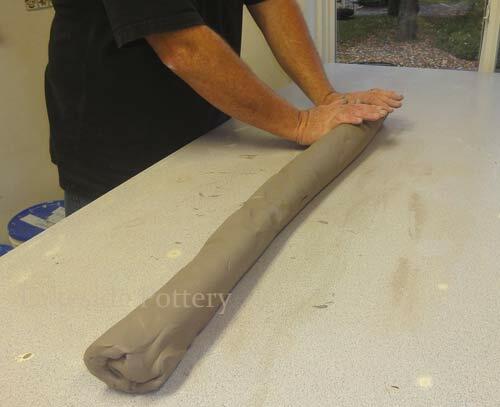 See trimming over a foam tutorial.